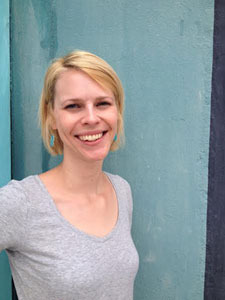 Carolyn Kimball is a printmaker, painter and kitchen mess-maker who lives in Austin, Texas. Formally trained as an artist, she creates both fine art prints and modern home decor. Kimball Prints, Carolyn's home decor line, draws its inspiration from the beauty of the natural world. Carolyn graduated with BFA from the Maryland Institute College of Art in 2003 and a MA in printmaking from the University of Louisville in 2008. Kimball Prints prides itself in being a boutique operation that provides artisanal, hand-crafted products. Each piece is handled by the artist through every step of the design process: starting with an original watercolor design, then screen-printed and individually packaged in her Austin studio. Kimball Prints is committed to using sustainable natural materials: 100% cotton fiber sourced from the USA, non-toxic inks and untreated Baltic Birch, creating modern, elegant home decor.